iPad Power Button Stuck Or Not Working? Here's The Real Fix! You are at:Home»iPhone»Power»iPad Power Button Stuck Or Not Working? Here’s The Real Fix! Your iPad power button is not working and you’re not sure why. Every time you try to press the button, nothing happens. In this article, I’ll explain what to do when your iPad power button is stuck or malfunctioning! A lot of the time, cheap rubber iPad cases can make it feel as though the power button isn’t working. We’ve also noticed an unfortunate trend that some rubber cases can actually cause power buttons to get stuck. Try taking the case off of your iPad and pressing the power button — is it working now? If it is, you’ll probably need to swap out your case. If the power button still isn’t working, keep reading! Is The Button Stuck Or Can You Press It Down? There are two distinct types of power button problems. Either the power button is stuck and you can’t press it at all, or the power button isn’t stuck, but when you press it, nothing happens! If your iPad power is stuck and you can’t press it, you’ll probably have to get it repaired. Fortunately, you can set up a virtual button on your iPad’s display that can hold you over until you’re ready to get it repaired. Skip down to the AssistiveTouch step to set up the virtual button! If you can press down your iPad’s power button, but nothing happens when you do, it’s possible you’re dealing with a software problem. Anytime you press a button on your iPad, it’s the software that decides whether or not something happens on the screen! To try and fix a minor software glitch, restart your iPad. If your iPad is running iOS 11, go to Settings -> General -> Shut Down. Swipe the power icon left to right across slide to power off to turn off your iPad. To turn your iPad back on, connect it to any power source using a Lightning cable — it’ll turn back on shortly after. if your iPad isn’t running iOS 11, you’ll have to turn it off using AssistiveTouch. In the next step, I’ll show you how to set it up and show you how to use it to turn off your iPad! AssistiveTouch is an Accessibility setting that puts a virtual button directly on your iPad’s display. It’s a great temporary solution when the physical buttons on your iPad are broken or malfunctioning. 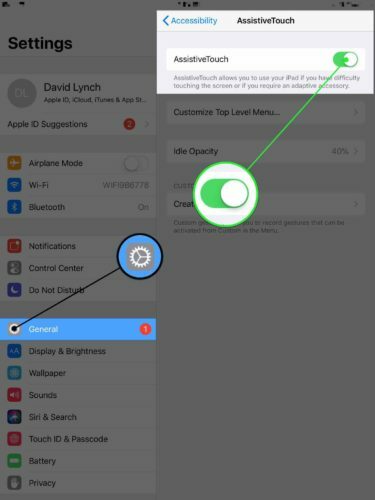 To turn on AssistiveTouch, open Settings and tap General -> Accessibility -> AssistiveTouch and turn on the switch to the right of AssistiveTouch. A virtual button will appear on your iPad’s display! 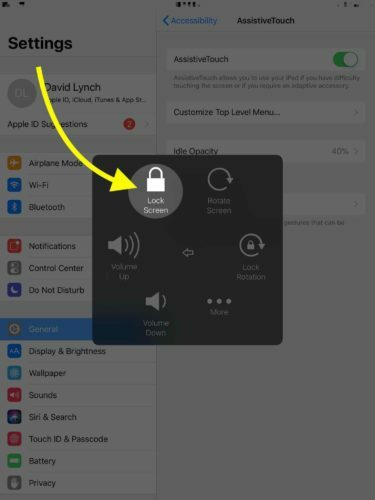 To use AssistiveTouch to turn off your iPad, press the virtual button and tap Device. Then, press and hold Lock Screen until slide to power off appears. If you restarted your iPad, but the power button still isn’t working, it’s time to put your iPad into DFU mode and restore. Before you do, let’s save a backup of your iPad. That way, you won’t lose any of your data or information when you restore your iPad. To backup your iPad, plug it into iTunes and click the iPad button that appears near the upper left-hand corner of the window. Then, click Back Up Now. 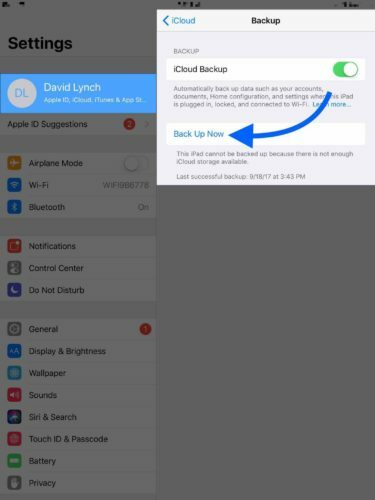 You can also backup your iPad to iCloud by going to Settings and tapping on your name at the top of the screen. Then tap iCloud -> iCloud Backup -> Back Up Now. Now that your iPad has been backed up, it’s time to put it in DFU Mode and restore. Since the power button is broken, you’ll have to enter DFU mode using a third-party software program like Tenorshare 4uKey. There’s no guarantee a DFU restore will fix your iPad power button that’s not working, so you may just want to go ahead and get it repaired rather than paying for a new software program. In the section of this article, I’ll discuss two repair options that’ll have your iPad working like new! When you’re ready to get the Home button repaired, you have a couple of great options. If you have AppleCare+, schedule an appointment at your local Apple Store’s Genius Bar. A quick word of warning: if your iPad Home button stopped working after coming into contact with water or another liquid, Apple won’t touch your iPad. AppleCare+ doesn’t cover liquid damage, one of the main reasons why an iPad power button stops working. If your iPad does have water damage, or if your iPad isn’t covered by AppleCare+, or if you want the power button fixed today, we recommend Puls, an on-demand repair company. Puls sends a certified technician directly to you in as little as 60 minutes. They’ll repair your iPad on-the-spot and give you a lifetime warranty! You’ve successfully fixed your iPad’s power button, or you’ve chosen a great repair option. Next time your iPad power button is stuck or not working, you’ll know exactly how to fix the problem! If you have any other questions, leave them in the comments section below! 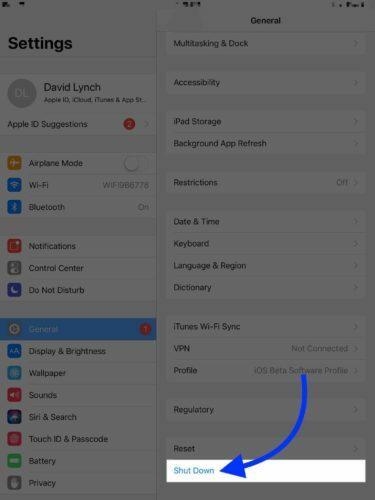 Previous ArticleiPad Home Button Not Working? Here’s What To Do! Next Article iPad Battery Problems? Here’s What To Do When It Drains Fast!